Hi! My name is Nancy Hoover and I will be serving as Mission Commander for Blast camp this summer. I will be leading the Program Team who will work directly with campers on a day-to-day basis, developing the themes and activities, and meeting with you face-to-face on a daily basis. I am also involved with Black Rock Outdoor education. I am a teacher, currently teaching at Anchor Christian Academy, a University Model school. I also participate as a Living Historian sharing outdoor and hearth cooking techniques. I began working with Black Rock’s Outdoor Education program in the fall of 2015. I love hands-on education and activities with children, and especially enjoy sharing new experiences with them. One of my favorite activities at Black Rock is Creek Studies, and I enjoy participating in archery! Hi! My name is Jon Hill and I am excited to be a part of Blast Day Camp! I will be working at Mission Control for Blast Day Camp answering phones, responding to e-mails, and handling all registration needs. I am also involved with Black Rock Retreat’s Outdoor Education and Group Activities programs. After working in youth ministry, I followed the call into camping ministry in 2007. In 2009, I completed a “Leadership in Camping Ministry” internship at Timber-lee Christian Center in Wisconsin. Later that year, I began working at Black Rock Retreat as of member of the Outdoor Education team. I met my wife at Black Rock Retreat in 2009 and we now have a four year old and a 1 year old. My favorite activity to lead is our Creek Hike and my favorite activity to be a participant in is Laser Tag. 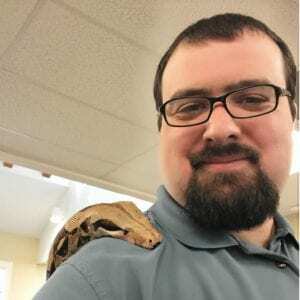 My favorite animal in the Nature Center is Charlie, the 7 ft Red Tail Boa who likes to take selfies with me.